Please note that users licensed for the data service can access our UK gas balances by clicking here. UK consumption rose in January, supported by a 0.3 bcm (4%) y/y uptick in LDZ demand paired with weaker power imports and renewable generation that pushed gas-fired generation to a record high. 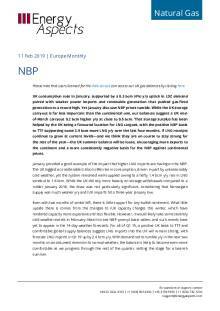 Yet January also saw NBP prices tumble. While the UK storage carryout is far less important than the continental one, our balances suggest a UK end-of-March carryout 0.2 bcm higher y/y at close to 0.5 bcm. That storage surplus has been helped by the UK being a favoured location for LNG cargoes, with the positive NBP basis to TTF supporting some 3.9 bcm more LNG y/y over the last four months. If LNG receipts continue to grow at current levels—and we think they are on course to stay strong for the rest of the year—the UK summer balance will be loose, encouraging more exports to the continent and a more consistently negative basis for the NBP against continental prices. January provided a good example of the impact that higher LNG imports are having on the NBP. The UK logged a considerable 0.6 bcm (6%) rise in consumption, driven in part by unseasonably cold weather, yet the system remained well-supplied owing to a hefty 1.4 bcm y/y rise in LNG sendout to 1.6 bcm. While the UK did rely more heavily on storage withdrawals compared to a milder January 2018, the draw was not particularly significant, considering that Norwegian supply was much weaker y/y and IUK imports hit a three-year January low. Even with two months of winter left, there is little support for any bullish sentiment. What little upside there is comes from the changes to IUK capacity charges this winter, which have rendered capacity more expensive and less flexible. However, it would likely take some severely cold weather events in February–March to see NBP prompt basis widen, and such events have yet to appear in the 14-day weather forecasts. 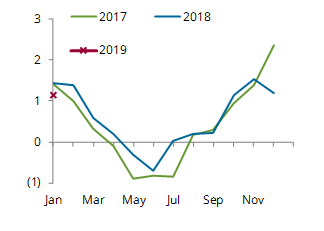 For all of Q1 19, a positive UK basis to TTF and comfortable global supply balances suggest LNG imports into the UK will remain strong, with forecast LNG imports in Q1 19 up by 2.4 bcm y/y. With demand set to tumble y/y in the next two months on an assumed reversion to normal weather, the balance is likely to become even more comfortable as we progress through the rest of the quarter, setting the stage for a bearish summer. The UK storage carryout is far less important than the continental one. Still, our balances suggest a UK end-of-March carryout 0.2 bcm higher y/y at close to 0.5 bcm. Given the small capacity of UK storage, getting those sites filled will be straightforward this summer, particularly with a power sector unlikely to see much demand-side response given the low base of coal-fired generation—2.6 GWh in summer 2018. Even if that coal-fired output were fully replaced with gas-fired generation, it would only add 0.4 bcm of gas demand over the entire summer of 2019. This suggests NBP prices may need to discount further to continental contracts y/y in order encourage UK exports to the continent. Last summer, the realised NBP basis averaged just 2 cents/MWh, with the market shifting from periods of premium to discount (most acute during IUK maintenance). We expect that higher LNG supply will move that basis down to a more consistent discount as UK regas becomes a gateway for LNG volumes. How far that discount can deepen will be limited, as while LNG imports could be less sensitive to price spreads between the hubs (due to long-term capacity holdings), they will not be fully insensitive. 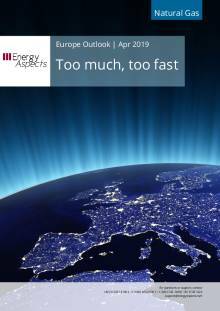 Differentials in short-term capacity costs for regas will be important and allow basis differentials to persist while still encouraging flows seemingly inconsistent with the geographic spreads in gas prices. However, that occurrence is limited, and big capacity holders such as Qatar do have capacity at both South Hook and Gate. If the IUK pipe becomes constrained (as well as the BBL when reverse flow begins, although that is not expected before October), the NBP basis will need to soften enough to push both LNG cargoes and Norwegian gas to the continent. With capacity bookings through IUK’s implicit allocation mechanism (IAM) still less than the 50% of what is on offer for summer 2019 and a seeming market distaste for PRISMA auctions, those constraints could bite a bit earlier. That said, a strong enough basis constraint should get participants into the market for capacity, while the underlying costs of using IUK should suggest a more consistent negative cash spread of at least the variable IUK costs of 1.8 p/th over the summer. The Norwegian maintenance schedule is looking relatively heavy for Q3 19, which helped push the Q2 19–Q3 19 spread into contango at the end of January. Revisions to the Gassco schedule since it was released back in October 2018 have listed 1.2 bcm more production and processing capacity offline in Q3 19, leaving total affected capacity at 5.3 bcm, 3.6 bcm more y/y and the most significant Q3 volume in at least four years. In contrast, just 2.4 bcm is scheduled to be affected in Q2 19. 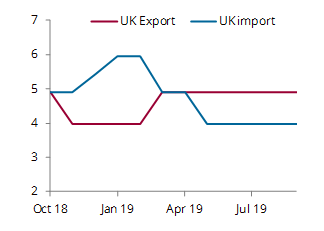 However, UK LNG imports in Q3 19 are likely to come in around 1.1 bcm higher y/y, which should more than offset the drop in Norwegian deliveries to the NBP and ensure that the UK will still see a ramp-up in its pipeline imports.